Omron Evolv is a bluetooth blood pressure monitor and one of the latest product in Omron line products. Omron has integrated blood pressure monitor with the smart phone. Omron is always in the zone and comes up with lot of innovative products that can enhance the customer’s experiences. 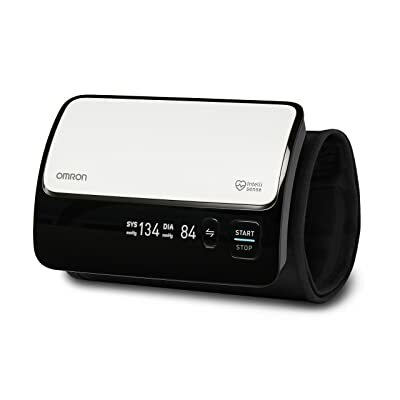 Evolv upper arm blood pressure monitor is a bluetooth enabled cuff that take the readings, rest of the work is done by Omron Connect App on smartphone. App is available for both Android and iOS platform. Once app is paired with the Omron device, your smart device will be your monitor and through App you can perform numbers of operations such as averaging, graphs, historical data etc. The one piece monitor is not only innovative but also clinically accurate. It uses an exclusive heart health algorithm called Advanced Accuracy. Device records more data points and removes interference caused by movement thus producing more precise, clinically-accurate readings. It provide correct reading without the hassle of wires. You need to place it properly on the arm and with a click of button, readings are recorded. You can view readings on the Omron Connect app on your phone. The innovative cuff have circumference of 9”- 17”. This cuff size is suitable for most of the adult. The cuff inflates and deflate automatically with the click of the button. The cuff is very slick and compact. It is suggested to apply the cuff to your upper left arm with the Start/Stop button positioned facing toward your body. Evolv is easy to wear and hold 100 readings. It shows the Systolic and Diastolic readings along with pulse. Once you measure the blood pressure, remove the cuff and sync your blood pressure monitor with connect app. Omron Connect App comes very handy when you need to look at your historical readings and you want to share them with your family and caregiver. Since the device record the readings, it can be used without the smart device. Single connectivity: Evolv connects with the smart devices via bluetooth. Once the device paired successfully, “Ok” will appear on the monitor. Memory: Unlimited in app, device can hold 100 readings. However, once it crosses the limit, it will overwrite the old readings. Thus, it is important to sync the monitor data with the app to keep history of the your measurements. You can transfer the reading based on your convenience, if for some reason, you want on transfer the reading laters. Open the app and tap on the syn icon to transfer the readings. Multi user: The monitor do support multi profile. The users need to have individual Omron Connect app on their smart devices. Once a person have taken the readings, she/he need to sync the latest readings with the app and wipe the monitor memory and then the second person can take the readings. Compared to its competitors such as Whitings, Evolv is cheaper. However, when compared to other Omron blood pressure monitors, the Evolv is pricey. The justification is, it is coming without the hassle of wires or hose. It looks sleek and stylish. It is worth the cost. 4 “AAA” alkaline batteries. It is not compatible with AC Adapter. The Omron Connect App works for both phones and tablets. Technology is rapidly changing and smart devices are replacing the clocks, cameras, books, etc., and following the same trend Omron came up with the blood pressure monitor that looks cooler without the wires and at the same time provide you the flexibility of viewing your measurements anywhere, anytime on the smart devices. Evolv upper arm blood pressure monitor is clinically tested for accuracy and provides lots of functionality that will revolutionize your experience of measuring the blood pressure. It is bit costly compared to other Omron monitors but is simple and intuitive. Best feature is the small display on the cuff such that you can use the monitor even without the smart device. Overall, this is one of the best bluetooth blood pressure monitor.